This was a birthday gift when I was like 16 or so. 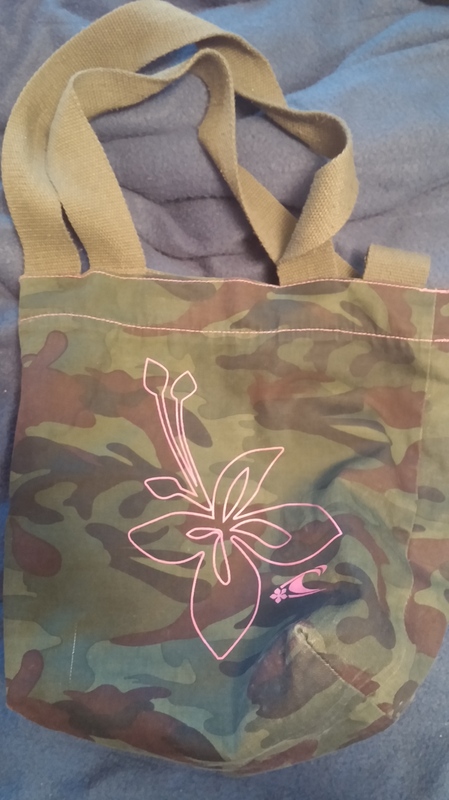 It’s a very comfortable purse to carry around due to the soft wide cloth straps and it washes easy since it’s canvas, which is important. It’s by O’neil, a surf brand that’s usually at PacSun. It has a velcro closure at the top which is essential for traveling. All purses should be made to snap shut since they should be made for function, not just design. All you need is some toothpaste and water for this trick, you don’t need any polish. I’ve always heard about doing this but just now tried it out! 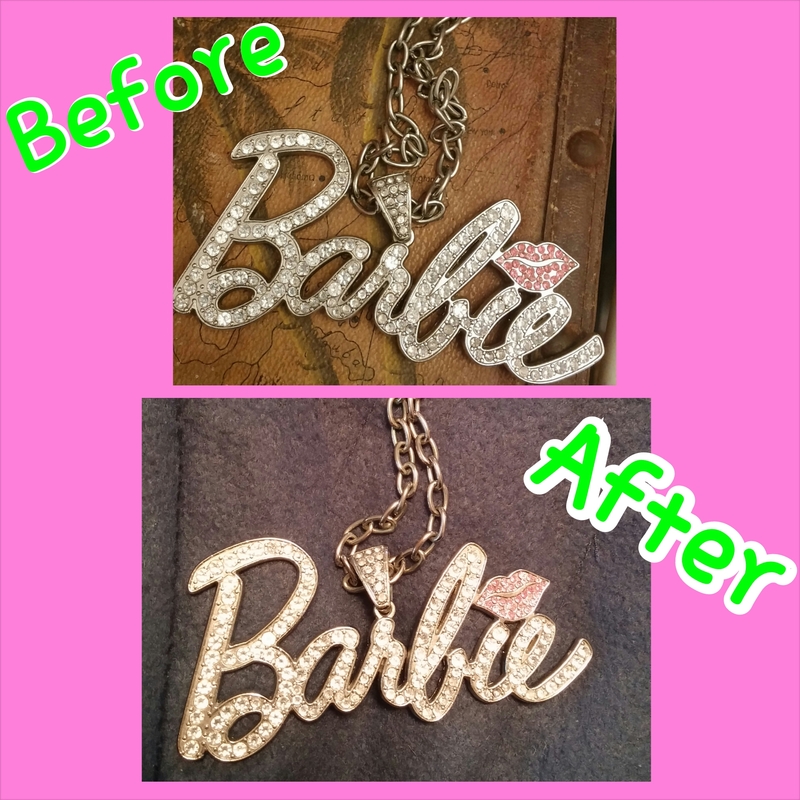 So, what you do is take the necklace or whatever kind of jewelry, cover it in tooth paste, then put it under the sink faucet. Make sure to get all the bubbles off so that it isn’t sticky. Afterwards, all the grime and dirt from sweat and just being outside will disappear. You can really feel a difference, and you can see it’s a bit more shiny. I didn’t use flash, tried to keep the lighting the same in each photo. I cleaned this necklace because I’ve had it for years and even wore it to a Warped Tour one year so it got sun tan lotion in it and looked very dull ever since. I think it looks better now, but I actually wanted it to look even shinier. Oh well. Anyways, hope this helps you out! ❤ Comment or like. 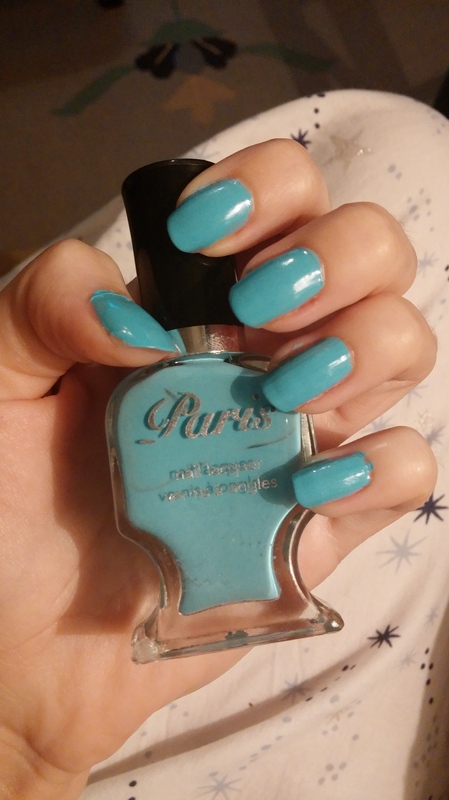 This is that same brand of nail polish from TJ Maxx called Paris that I used in my last nail post. 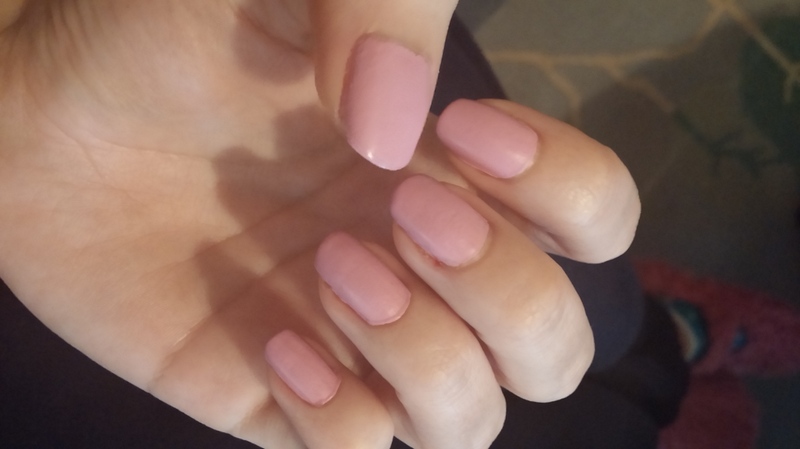 A few posts back I posted what the matte pink color looked like. It was very girly and pretty, take a look back and see for yourself! The only reason I don’t use these polishes a lot is because they take 4 or 5 coats to be perfected, which can be time consuming and frustrating. You have to be in a good mood to paint your nails, otherwise you will just keep messing up. This color is equally as pretty as the pink, just wish that it was matte like the pink was because that would be different and I like different! Shiny nails are everywhere, but regardless baby blue is always a nice shade. I received a lot of positive compliments on this polish from men and women and was told again that I should hand model, haha!! Tell me what you think, likes, comments, or questions are ALWAYS appreciated. Talk with you later! I like this scent because it smells like a pastry shop. 😀 I thought about getting the coffee scented candle but, I decided this might smell even better. The only down side to candles that smell like food is that they make you hungry!! Sweater and camisole are from Victoria’s Secret, leggings are old so IDK where they are from, and boots are Black Poppy. Lipstick is Red Revival from the Color Sensational Maybeline collection. I was quite pleased with how this turned out. 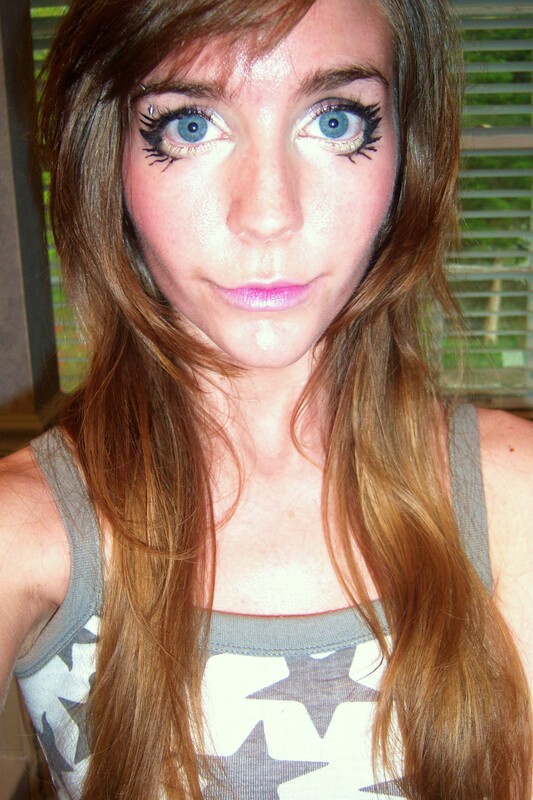 You can do this look for halloween or some other costume occasion. 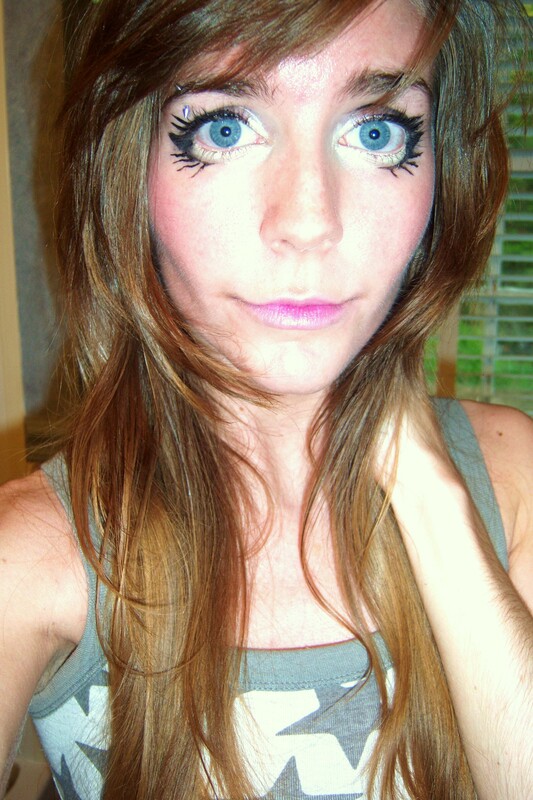 I did my eyes like a cartoon character or anime character today. YES, it looks weird, that’s kind of the point. Not supposed to be super amazing looking, just supposed to look like fictional people!! Can you GUESS what my favorite color is?! That’s right, pink. It’s the best color ever created. Lol. I am in love with all these pink products!!!! Read about what I think of these gems below and then tell me what you think. I just got this lip tar by Obsessive Compulsive Cosmetics in Anime, it’s the color nearest the top in the photo above. I like it because it is all natural, has a very light weight feel to it, isn’t sticky, and it’s neon!! Neon pink is so shiny and vivid. It is a bit messy though, the tube it comes in is strange and you have to be careful it doesn’t drip everywhere. It is very pretty but I wish it stayed on longer, it stains your lips but doesn’t stay on the way I thought it would like after you eat and drink. 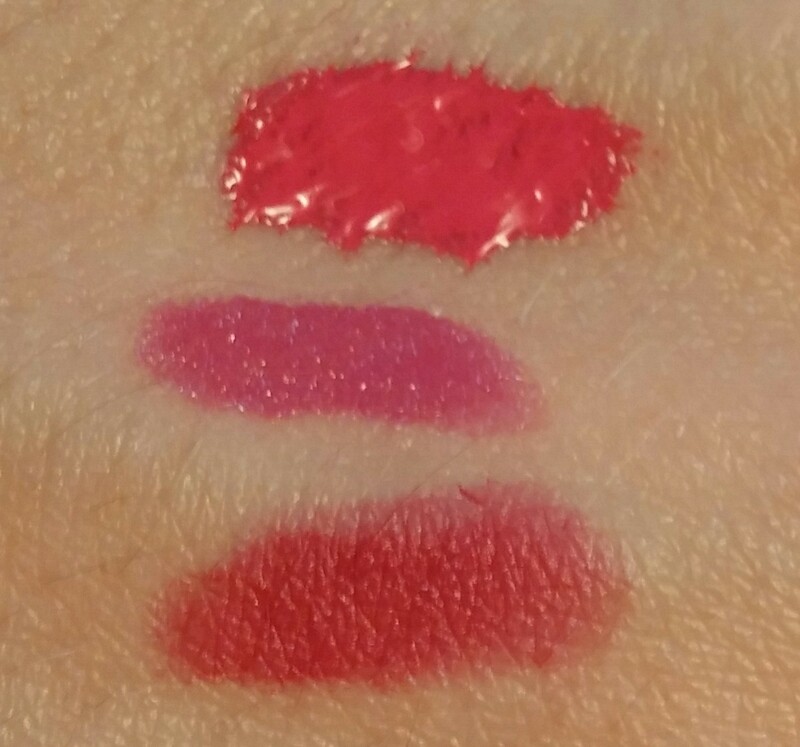 The color in the middle is a lipstick from the Color Sensational Vivid collection by Maybeline called Hot Plum. This is probably my favorite lipstick, I’ve had it for a few months and am just now writing about it. I wear it very often because it’s the perfect color to bring out my baby blues and also because it’s different. It is a similar hue to these other pinks, but it has violet mixed in with it to make you stand out. Purple lips are always a statement, but this is a very toned down version of bright lip color. It’s not distracting, you can still wear it on a daily basis without looking like you’re from a freak show. I wish this was a lip tint or stain but it’s just traditional lipstick. 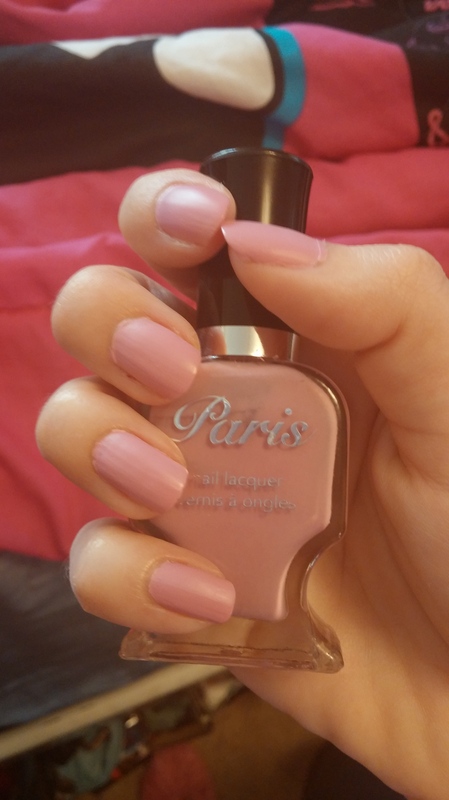 The color featured last in the image above is Lively by Tarte. It’s natural, smells like real peppermint, and feels uber soft when you rub your lips together. It’s a matte color which means it doesn’t have a shine to it. I like matte colors because I don’t have many, although you can pat any lip stick and make it flat. This color has a rose color in it, it’s a darker pink than the other colors, it almost is red. 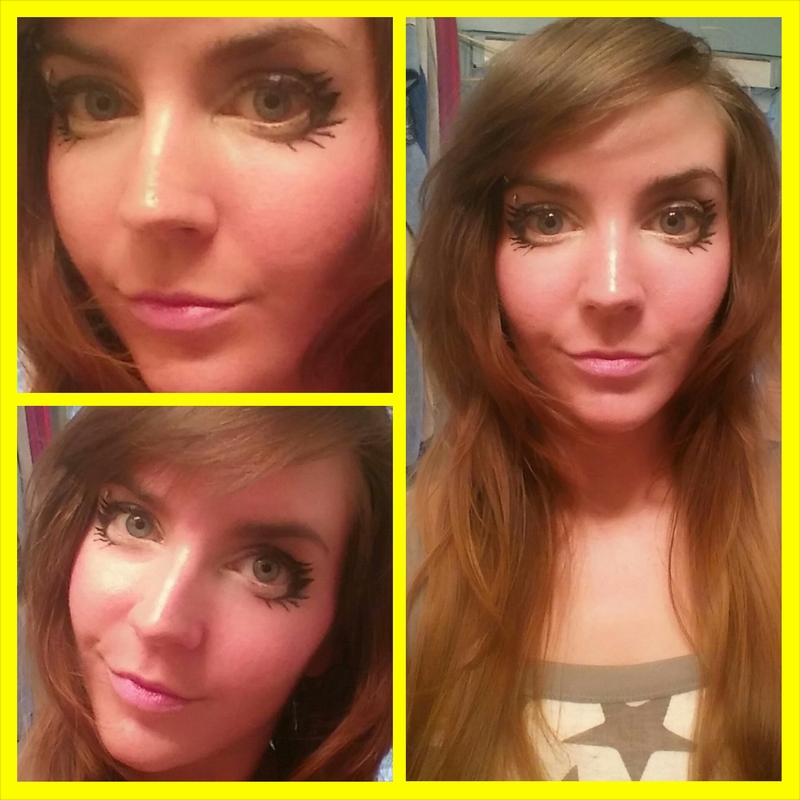 When you apply, make sure to use lip liner so it doesn’t feather out. It will stain your lips but you do need to reapply it after eating and drinking because it fades. 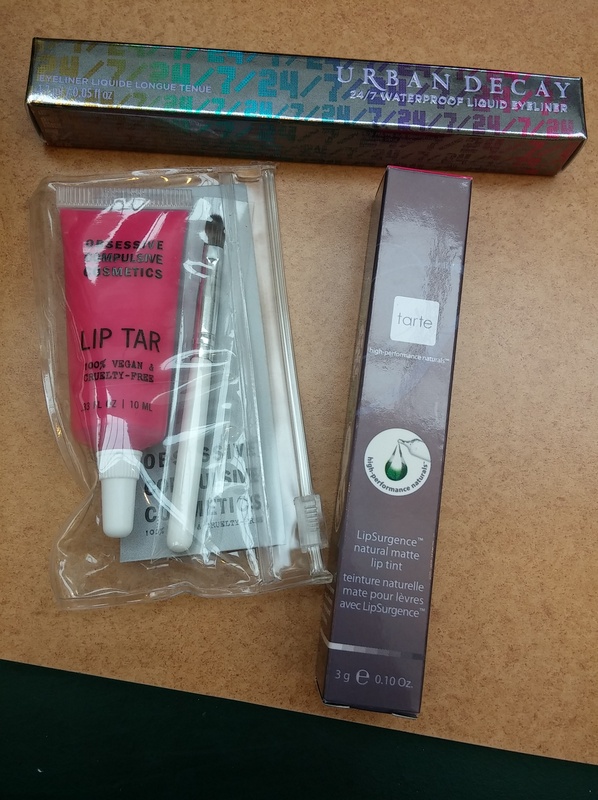 Got some new makeup stuff at Sephora! 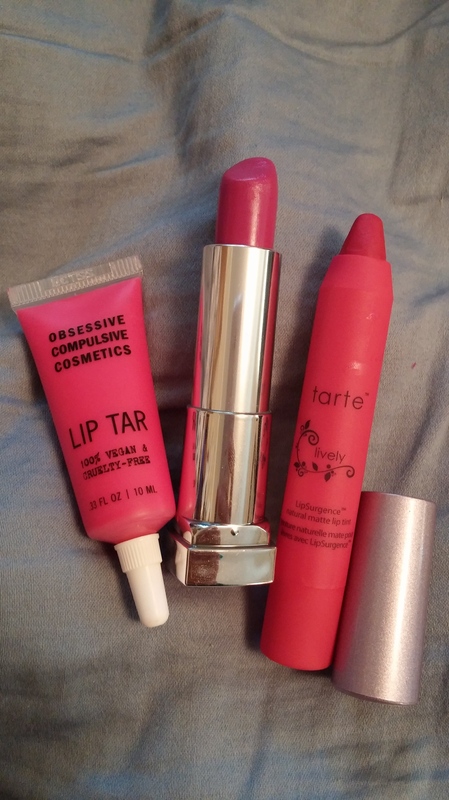 Urban Decay 24/7 waterproof liquid eyeliner in Perversion, Lip Tar by Obsessive compulsive Cosmetics in Anime, and the matte Lively lip color by Tarte. I will post reviews of these products individually later on! So stay tuned fans. 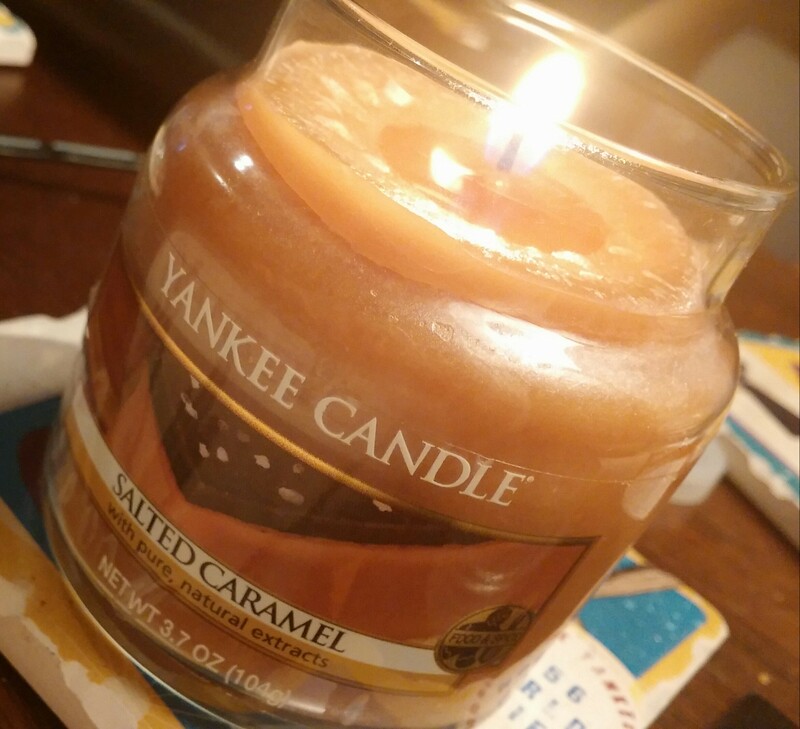 This is my newest favorite candle from Yankee Candle. 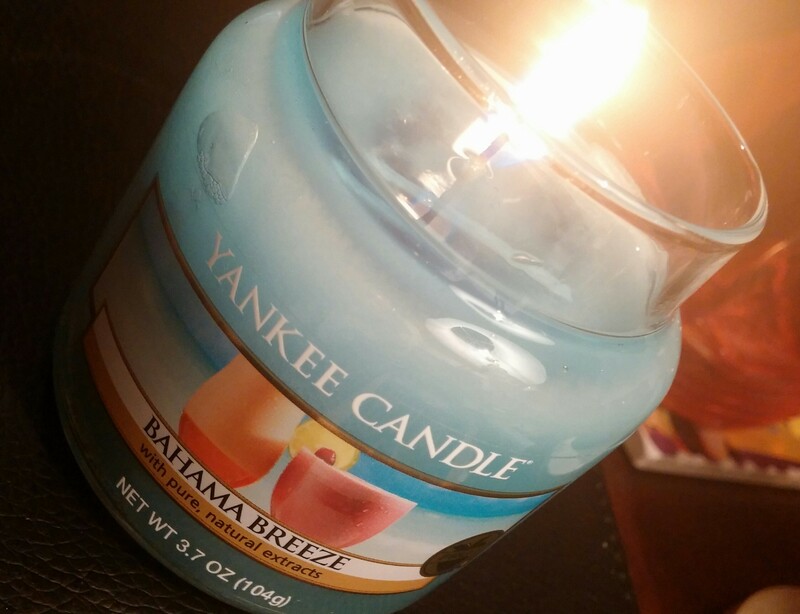 It’s called Bahama Breeze and smells like a fruit smoothy. Time to get into the summer mindset right? Alright, comment or like, or whatever! 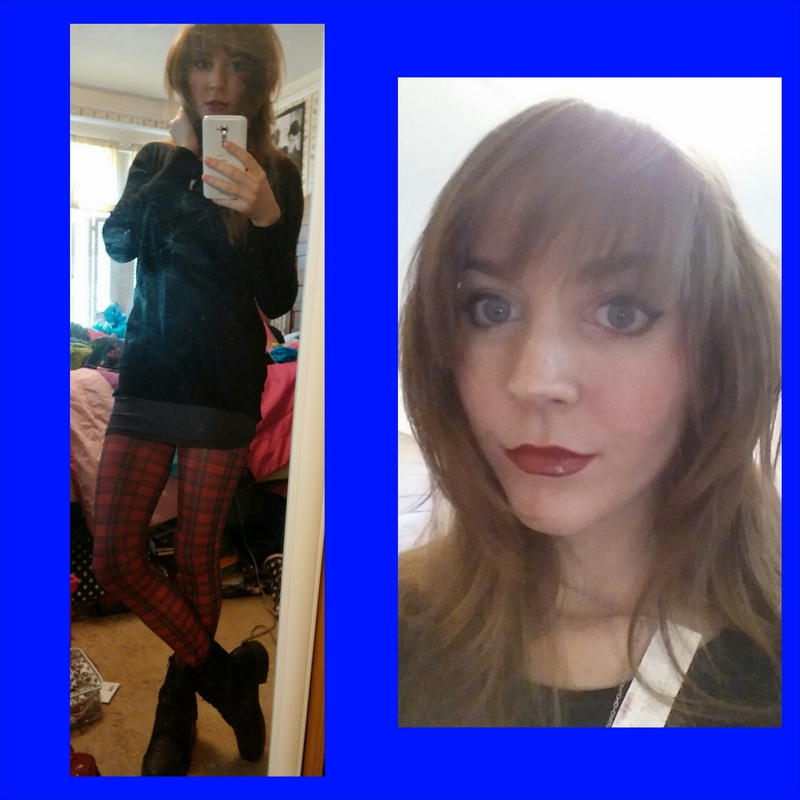 I usually wait till I am more tan to wear little gettups like this, but oh well. 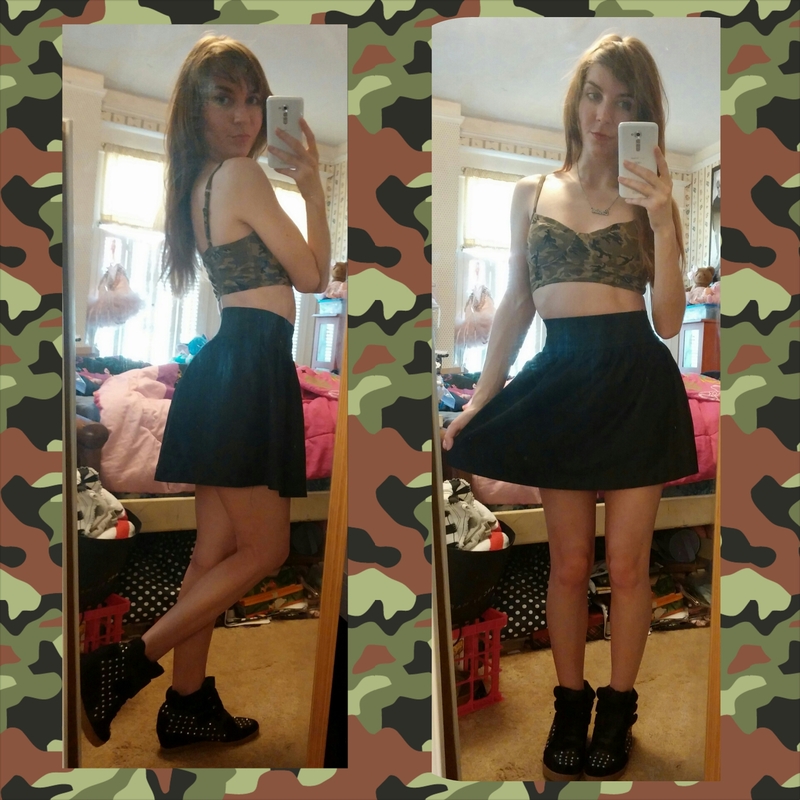 It was warm the other day so I decided to take advantage of it and wear summer clothes. I cannot wait to get some color though, I’ve only tanned once so far because it’s not super warm out yet. I bet summer will be upon us before we know it though! Fingers crossed at least. The crop top is by Kirra, denim skirt is from the Miley Cyrus and Max Azria line, and wedge sneaker shoes by Forever 21.